A new poll suggests that facilities like New York City’s 9th Avenue protected bike lane, above, are popular with rich and poor, young and old, Republican and Democrat. 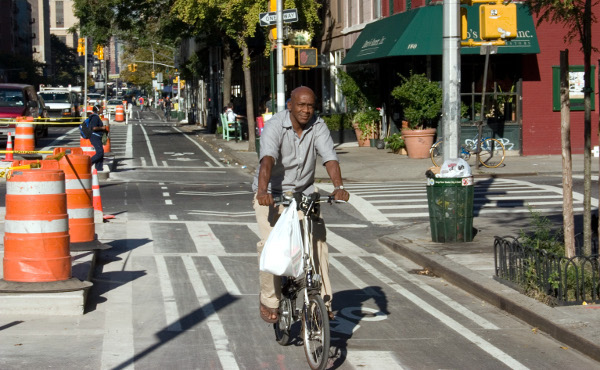 For the last six years, New York City has led the country in its embrace of protected bike lanes as a new standard for efficient commercial corridors. A new poll is the latest to suggest that its voters are in support. The key: associating these street design improvements with safety. In a poll of 875 likely voters in New York City’s upcoming mayoral election, 67 percent of respondents (including 65 percent of those who own cars) said they support “bringing protected bike lanes and pedestrian islands” to their neighborhoods, polling firm Penn Schoen Berland showed Monday. Voters in support included 68 percent of males, 67 percent of females and a whopping 78 percent of voters under 35. Clear majorities in every age demographic supported these projects. Voters who identified as black or Hispanic were even likelier to support the measures (71 percent and 74 percent) than voters who identified as white (61 percent). Transit riders showed strong support, with 72 percent of people who ride MTA at least once a week saying they want protected bike lanes and pedestrian islands. Further sealing the coffin of the false argument that bike and pedestrian improvements are handouts to the wealthy, the poll found that the lowest-income voters have the strongest support for such projects in their areas — but that 64 percent of people with incomes over $75,000 a year support them, too. Nor is better biking and walking a divisively partisan issue. Though Democrats are most intensely and strongly in favor (71 percent in support, with 44 percent in “strong support”), Republicans and independents also back the measures (63 percent and 59 percent). The poll’s overall margin of error was 3.3 percent at a 95 percent confidence margin, larger for subgroups. But the fact that the poll made its own position clear doesn’t mean that people don’t support better biking and walking in their neighborhoods: just the opposite. It means that when the advantages of these street changes are made clear to voters, they’ll support them. It means that by presenting a clear case for why these street improvements are good for everyone, a gifted politician can use them to build public support. Which is exactly what we’d love to see two particularly gifted politicians in New York doing over the next month. Green lane idea of the day: Protected bike lanes may seem divisive when they’re just abstractions, but when their safety benefits are made clear they are widely popular.